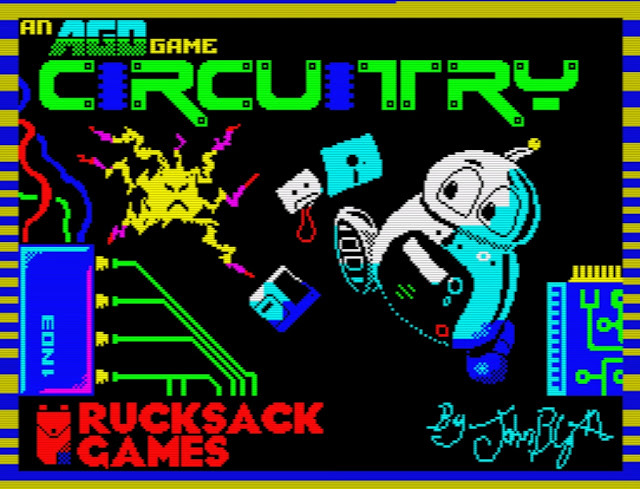 Indie Retro News: Circuitry - John Blythe's electronic ZX Spectrum game is here! Circuitry - John Blythe's electronic ZX Spectrum game is here! Indie Retro News is almost back of our holidays so to kick it up a notch here's a new game from Rucksack Games aka John Blythe, Circuitry for the ZX Spectrum. In this game developed using Arcade Game Designer by Jonathan Cauldwell. You play as the Nan'O'Bot, a bot sent into a mainframe to save as much data as possible after a major hack at the private outsource R&D company Revanox! You have to complete this task but beware not only is the fate of human kind in the balance, but there's uncontrollable AI to deal with as well! The idea behind the game is pretty simple, avoid the enemies and traps, pick up the data, get to the transfer zones and do it all again in the next area. But what makes this game more than your average arcade platformer is the brilliant design of the levels. Each high quality level is set up to look as if you were working your way through a circuit board, complete with chips, caps and electrical nodes. Although if this was an Amiga 500+ you would probably expect a leaking Varta battery or two. So how is the game and is it any good? Well yes, Circuitry is very good! In fact I haven't played a ZX Spectrum platformer this good and unusual looking for some time. Especially as it isn't frustrating to play and even with all the busy elements seen in the screenshot above, it all just fits with ease. But there is a downside, I wasn't able to enjoy the enhanced 128k version with music that was shown in the video above, as that one is currently only available from: Monument Microgames. Still even without the music I'd recommend this game highly to anyone!